Following in the footsteps of microbreweries, Waynesville Soda Jerks is developing a niche market for homegrown soft drinks. Their bubbly beverages, dubbed “Southern Appalachia in a bottle,” use ingredients sourced from farms throughout Western North Carolina to provide seasonal, fresh flavors. Chris Allen and Megan Brown—aka “The Jerks”—are recent by-products of Haywood Community College’s entrepreneurship program and partners in the soda business. Former high school sweethearts, they reunited about five years ago. The idea for their company was sparked when Brown bought a carbonation system in early 2013, quickly realizing that the provided syrup samples were chemically derived and artificial. Not pleased, the couple decided to take a crack at crafting their own syrup with berries harvested from their backyard. “We thought, ‘This is great; it’s a natural fruit soda,’” Brown remembers. 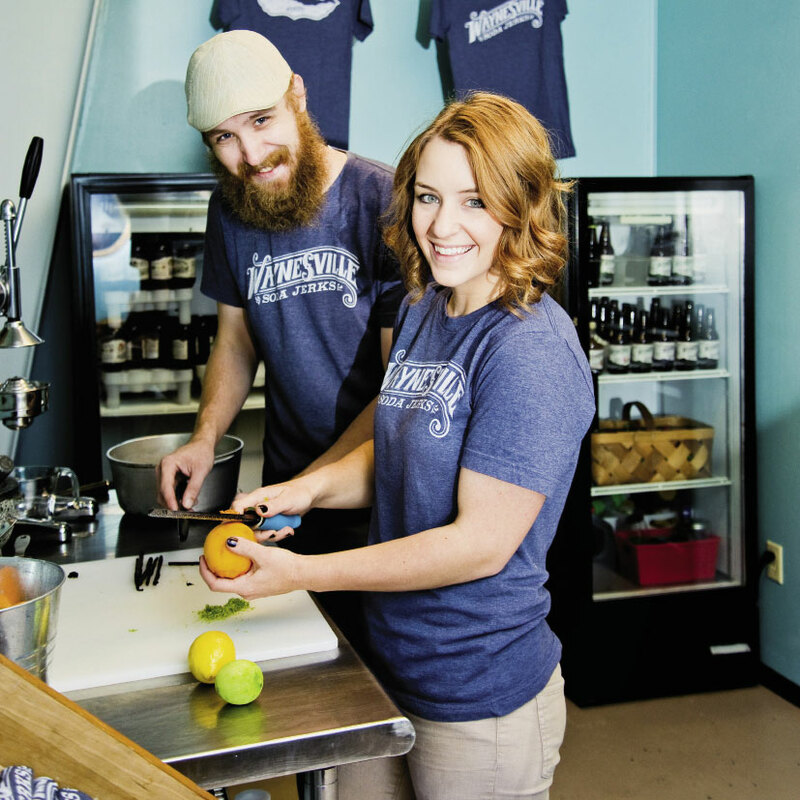 With a syrup-filled refrigerator, they quickly outgrew their home processing operation and decided to move into what was then HCC’s Student Business Incubator, which is now part of the Center for New & Expanding Businesses in Waynesville. Partnering with organizations like the Appalachian Sustainable Agriculture Project and Buy Haywood, The Jerks have been able keep their product decidedly local. And no matter how bustling business may be, they continue to sling their sodas at the farmers market, which has helped them sustain relationships with area farmers. To purchase Waynesville Soda Jerks’ bottle sodas and syrups, visit www.waynesvillesodajerks.com or call (828) 278-8589. Combine orange juice, rosemary, and orange zest in a medium saucepan. Bring to a simmer over medium heat, stirring occasionally. Once simmering, remove from heat. Add honey and stir until it dissolves. Cool and strain into a glass container. Store syrup in refrigerator for up to a week. To make the soda, mix two-thirds cup syrup with two-thirds cup seltzer water. Fill a Mason jar with ice. Pour desired amount of whiskey over ice and top with Molasses Cola. Stir and garnish with orange wedge.